China-India relations are a complex mix of cooperation and competition. As the two largest emerging economies, their ties are of great significance to regional stability and even global development. After going through a turbulent phase, bilateral relations started to improve in 2018 and some speculated that there would be a new beginning for the world's two most populous countries. However, despite increasing cooperation between the two sides, uncertainties and divergent opinions remain. 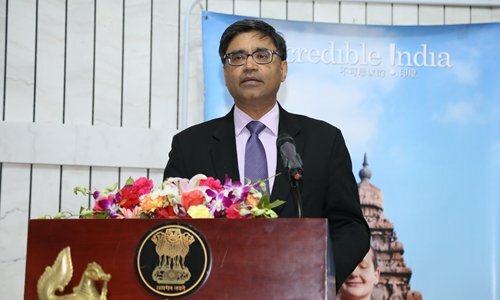 Global Times reporters Xie Wenting and Bai Yunyi (GT) talked to India's new Ambassador to China, Vikram Misri (Misri), on India-China relations, economic and trade cooperation, the Belt and Road Initiative (BRI) and more. GT: What is your top priority as Indian Ambassador to China? In which areas will India strengthen cooperation with China in 2019? Misri: There are three areas that would be my leading priorities during my tenure. First is enhancing economic cooperation between India and China. Bilateral trade will cross the $100 billion mark this year. However, this figure includes a deficit of $58 billion for India and this deficit has been increasing over the years. Addressing this trade deficit would be one of my priorities because it is not really sustainable in the long term. We have been working with the Chinese side for ensuring greater market access to Indian agricultural products such as sugar and rice, as well as various fruits and vegetables, and are also closely cooperating with them for greater access to other products that are globally recognized as strengths of India, such as pharmaceuticals and IT. Progress has been made in some of these areas, but translating this progress into actual and sustained exports is important. We hope that in this regard, we will receive support from the Chinese side and expand our trade basket. The second focus area for me would be to enhance people-to-people and cultural contacts. In 2018, the total number of travelers from China to India and vice versa added up to just 1 million, which is a minuscule number when we consider that our combined population is 2.6 billion. We need to change these figures and promote our countries as preferred tourist destinations for each other. This would be the best way to enhance trust and understanding between our two peoples and further strengthen our overall bilateral relationship. The year 2020 will mark the 70th anniversary of the establishment of diplomatic relations between India and China and enhancing these exchanges would be an important component of the celebrations to commemorate this important anniversary. The third focus area for me would be to promote cooperation between India and China in regional and global affairs. As two large and developing economies of Asia, India and China share common concerns and positions on many issues of regional and global importance such as climate change, energy security, counter-terrorism and the international trading system. We would like to further strengthen our cooperation in all these areas. GT: Do you think China-India relations are back to the "normal track"? How important is the Indo-China relationship in India's diplomatic picture? Will the results of India's upcoming general election affect ties with China? Misri: The bilateral relationship between India and China is of great significance not just to the two countries, but also to the larger region and the international community. The Wuhan summit between Indian Prime Minister Narendra Modi and Chinese President Xi Jinping in April 2018 was a milestone in bilateral relations during which the two leaders exchanged views on overarching issues of bilateral and global importance and elaborated their respective visions and priorities for national development in context of the current international situation. During the course of last year, the two leaders also met on the sidelines of multilateral summits. These meetings have reinforced strategic communication between the two countries at the highest levels and helped in elaborating a road map for continuing contacts. China is India's biggest neighbor and we assign a very high priority to this relationship. Unlike some fifty years ago, when our relationship had a much narrower basis and there was not much communication, today we have what one would call a full-spectrum relationship. This has been possible because our respective leaders have realized that mutually beneficial cooperation responds to the most urgent developmental needs of our people and these needs to be prioritized over other issues. It is true that general elections are scheduled to be held in India over the next two months. However, my own feeling is that, on foreign policy issues, there is a broad political consensus in India on where our national interests lie. I do not think, therefore, that the outcome of the elections will impact the broad contours of India's foreign policy in general or the very important relationship with China in particular. GT: Competition or even confrontation between China and India in the South Asian region is a hot topic in Indian media outlets. Why does India care so much about China′s presence in those countries? Do you believe there is a necessity for India and China to take steps to avoid geopolitical competition in this region? Misri: I do not think that there is really any confrontation between India and China in the South Asian region. We are both large countries with several important relationships in the region and both of us bring unique contributions to each relationship. India's leaders have long felt that there is enough room for both India and China to grow and achieve their objectives together. As two large neighboring countries which share a long border, it is inevitable for our relationship to have elements of both cooperation and competition. But competition does not necessarily translate into confrontation and in fact healthy competition can lead to further development of the region. If we consider this issue at a pragmatic level, we will find that elements of cooperation far outweigh elements of competition between us. GT: India seems to have a complicated perception of the Belt and Road Initiative. Could you explain where this complicated concern comes from? Will India send a delegation to the second Belt and Road Forum for International Cooperation in April? Misri: To be honest, we have made no secret of our views and our position on BRI is clear and consistent and one that we have conveyed to the authorities concerned. India shares the global aspiration to strengthen connectivity and it is an integral part of our economic and diplomatic initiatives. We are ourselves working with many countries and international institutions in our region and beyond on a range of connectivity initiatives. However, it is also our belief that connectivity initiatives must be based on universally recognized international norms, good governance and rule of law. They must emphasize social stability and environmental protection and preservation, promote skill and technology transfers and follow principles of openness, transparency and financial sustainability. Above all, connectivity initiatives must be pursued in a manner that respects sovereignty, equality and territorial integrity of nations. No country can participate in an initiative that ignores its core concerns on sovereignty and territorial integrity. GT: China and India have pledged to further enhance bilateral trade and economic cooperation. Bilateral investment has seen a steady increase over the past years. What will India do to further develop bilateral trade and economic cooperation? What kind of Chinese investment does India want? Misri: India has been working with the Chinese side for export of a greater number of Indian goods and services to China. There has been some progress in this regard and market access has been granted to some Indian agricultural products, even though we still need to translate this market access into actual exports so as to expand India's export basket to China and bring down the deficit. In addition, we also need to address the barriers for greater access to Indian pharmaceuticals and IT products and services in the Chinese market. The growth in bilateral investments has not kept pace with the expanding trade volume between two countries. While both countries have emerged as top investment destinations for the rest of the world, mutual investment growth is yet to catch up. Many of the Chinese companies are doing good business in India. Xiaomi and other Chinese companies are among the largest distributors of mobile phones in India. We welcome these companies to set up their manufacturing bases in India, which would contribute to lowering the trade deficit. We would also like to see more Chinese investment in infrastructure, such as roads and railways, industrial parks and in the food processing sector. Another welcome area for Chinese investment would be the hospitality sector, such as restaurants that cater to the Chinese palate, which in turn would be an attractive factor for Chinese tourists. GT: The number of overseas trips made by Chinese tourists had reached 140 million in 2018, but not many of them chose India as their destination. What holds back Chinese tourists from visiting India? What measures will India take to attract more Chinese tourists? Misri: One of the main reasons for the low number of Chinese tourists visiting India could simply be lack of information. We are taking energetic steps to bridge this information gap and China has been identified by us as a priority market for India's tourism promotion. We have taken various measures in this regard, such as identification of ten iconic locations of interest for the Chinese tourists, implementation of the e-Tourist visa facility, a dedicated toll free helpline number which has a Chinese language option, etc. Given its cultural and geographical diversity, India promises an unparalleled experience for the Chinese tourist as it can provide a mix of heritage, adventure, wellness, medical and spiritual experiences, in addition to the usual sightseeing and shopping. Our Embassy and the Indian Tourism Office in Beijing would be happy to work with the Chinese travel and tourism trade operators to bring these unique experiences to Chinese tourists. GT: The people-to-people exchanges between China and India still remain at a low level. What measures can we take to improve it? And what are the major challenges in this area? Misri: I agree that the people-to-people exchanges between our two countries are not where they should be. For instance, despite a total population of 2.6 billion, only 1 million Chinese and Indians traveled to each other's country during 2018. This shortcoming has been noticed by our leaders and, during the Wuhan informal summit in April 2018, Prime Minister Modi and President Xi agreed that the people-to-people exchanges were a significant part of India-China relations and, in order to achieve sustained progress in bilateral ties, it is important to build greater mutual understanding between the people of the two countries through cooperation and exchanges in diverse areas. In this context, they agreed to establish a high level mechanism for cultural and people-to-people exchanges to be chaired by the foreign ministers of the two countries. The first meeting of this mechanism took place in December 2018 in New Delhi, which identified 10 areas of cooperation, including cultural exchanges, media exchanges, film and television, museum management, sports, youth exchanges, tourism, state- and city-level exchanges, traditional medicine and yoga and education cooperation. Both our countries are determined to intensify cooperation in all these areas and next year when we embark on the celebration of the 70th anniversary of the establishment of diplomatic relations between our two countries, these areas will be in the focus. GT: Besides all the areas we′ve already mentioned, are there any other sectors with great potential for broader Indo-China cooperation that have not been given enough attention? Misri: India and China are two vast countries which are developing fast. This provides us with many functional areas where we can strengthen our cooperation. Both the countries have many developmental challenges where we can learn from each other's experiences. India and China could also strengthen cooperation at various international forums, especially those dealing with the environment, climate change, energy security, trade and counter-terrorism. There is considerable common ground to be explored in these areas between our two countries.